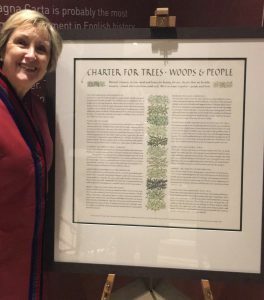 The Charter for Trees, Woods and People has been created to record the importance of woods and trees to us all and also to commemorate the 800th anniversary of the 1217 Charter of the Forest which is now in Lincoln Castle. 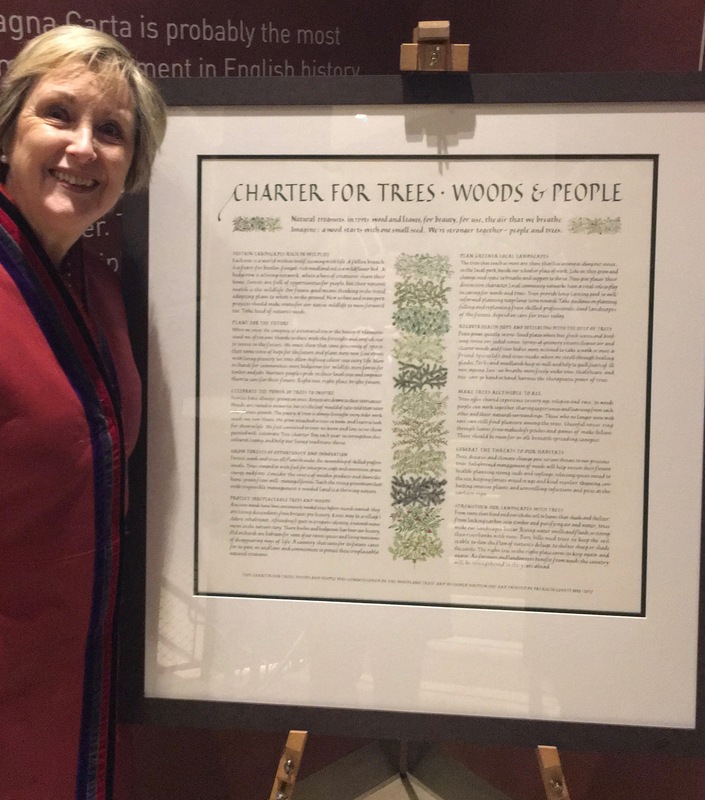 This early Charter, sealed by Henry III, re-established rights of access to royal forests. The Woodland Trust led on the new project for the nation, collecting comments and ideas from many people, and putting together ten tenets of contemporary views of the value of trees and woods to people. I was delighted when I heard that I had been the unanimous choice to carry out this important and prestigious commission. I needed the text before I could start doing anything really, and once I had it I appreciated that it was quite lengthy! 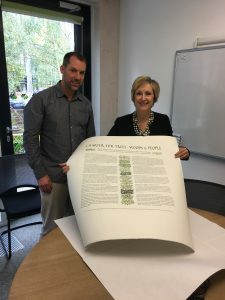 As this piece was going to be framed, the size of writing needed to be larger than for something held in the hand such as a book, as people stand further away to read and look at things on the wall so I couldn’t really use anything smaller than a size 5 nib, and the writing style had to be a compact one such as Italic. 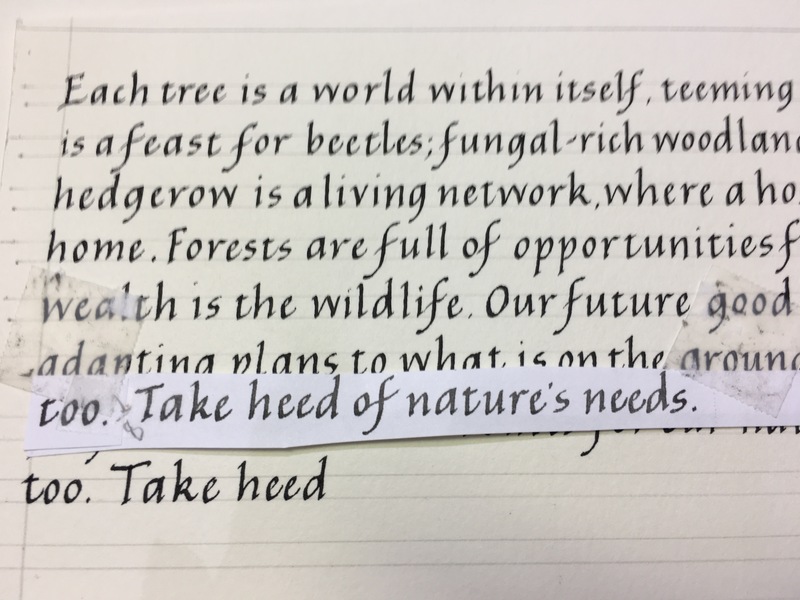 The title set the width of the piece, and although I wanted to write it in strong wide Roman Capitals (as can be seen here in the first tryout of the title), I realised that I needed to reduce the width as it would have made the piece really wide and rather unwieldy! I kept to the usual proportions for Roman Capitals, but just reduced the width of the round letters which seemed to work. This shows my first writing out of the text. I didn’t really have time to consider the design for long as everything had to be completed, from first sight of the text to final piece, in about six weeks, so sizes of the various blocks of text, inter-linear spacing, layout etc, had to be done pretty much instinctively and based on previous experience. I used as a guide for the text blocks the longest sub-title, but realised once I had written out all the text that this would have left far too much space between the two columns and the illustrations would have dominated the text, but it was good practice anyway for writing out the lengthy text blocks. So, with a lot of measuring – never my strong point – I wrote out all the text again with columns the width I thought they should be to allow for a narrower central column of decoration. 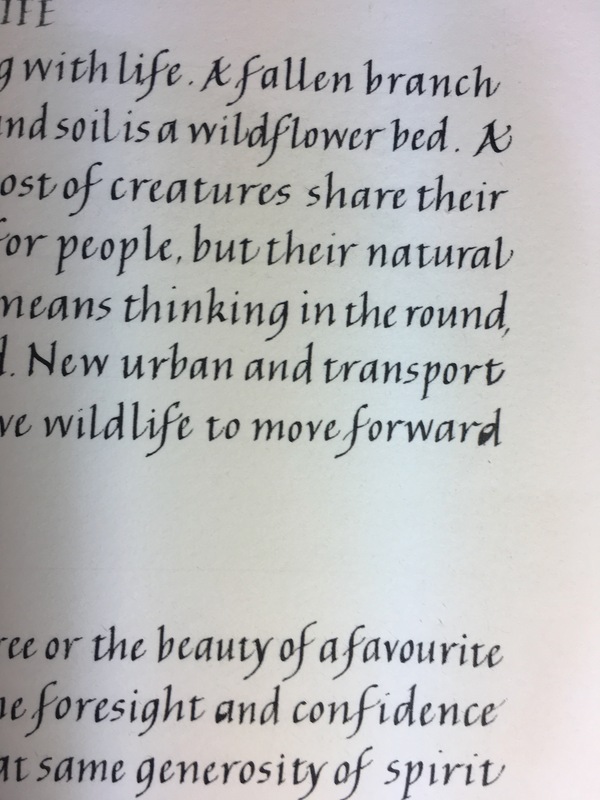 As I was writing out the text blocks in rough, I realised that they were working out sort of justified, with a straight margin on the left and also on the right. 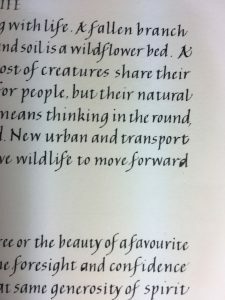 Now in calligraphy we really never seek to justify text because it can make the spacing look very uneven, just as it does sometimes in printed text. And it also adds another level of stress which really isn’t needed for something like this, but …! 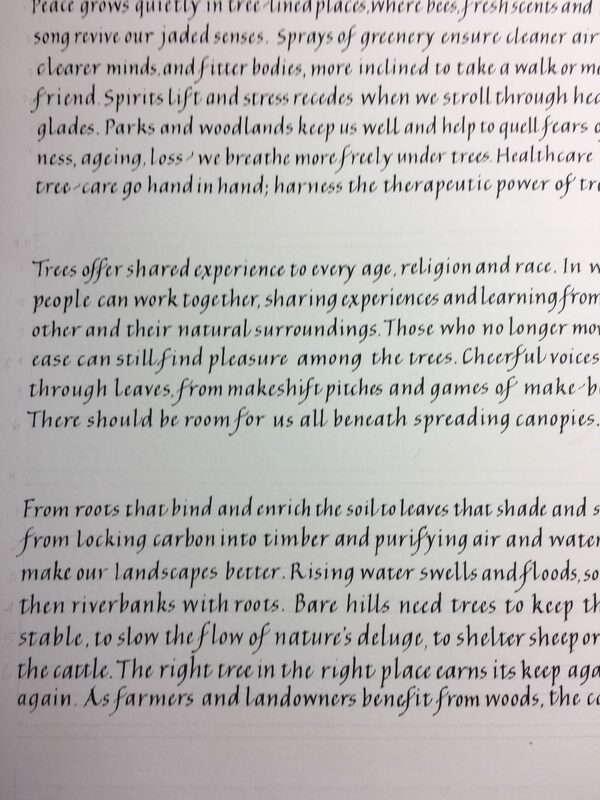 The Woodland Trust, understandably, wanted me to use oak gall ink. This wasn’t a problem as I do use it often, and have just done a major project using this. However, I didn’t have time to make it myself and they had someone who was doing this anyway for the Charter. 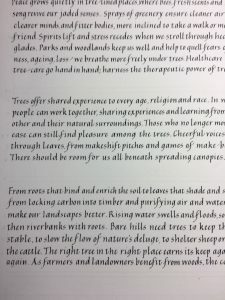 Unfortunately, the ink supplied created further challenges as shown here. Another problem to test and overcome! So with the text written, the headings done and the central column indicated, it was time to draw the lines. However, it wasn’t quite as straightforward as that! The first column was a line longer than the second column, and the sub-headings were in a different writing style than the text. It took quite a bit of measuring and re-measuring to work out exactly the inter-linear spacing to ensure that both columns ended up at the right place. Setting out the whole piece was immensely time-consuming and yet again I misjudged how long this seemingly simple process would take. I tackled the text blocks first. Having written them out in rough, when I was more relaxed, I knew that the spacing would be about right – not tight and tense. So I photocopied all the text, cut the photocopies up into strips of individual lines, and attached these just above where I was to write each line to avoid making mistakes. The lines were very carefully numbered! 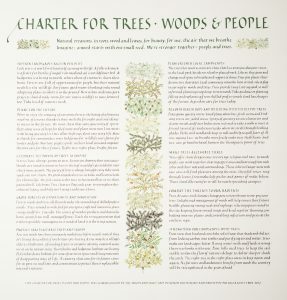 The Woodland Trust wanted the Charter on paper not vellum (to avoid upsetting those who are sensitive to such things), despite me pointing out that the paper I would use wouldn’t be tree-based but from cotton or linen rag. 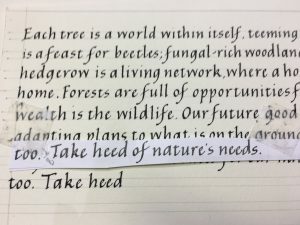 Now I really don’t like using paper, because when using a sharp nib, it often picks up paper fibres which can’t be seen until they mess up the letters as here – note the ‘d’ at the end of the last line in the upper text block. 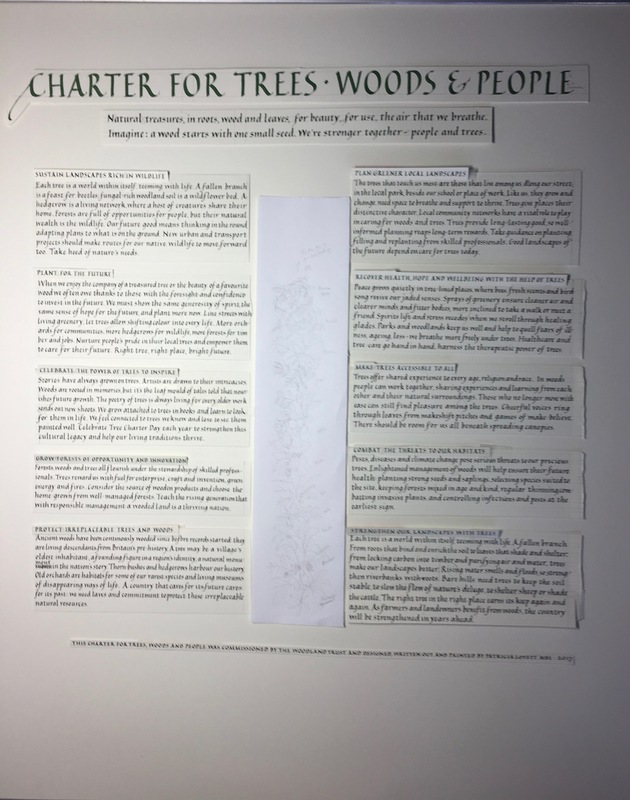 Then it was time to write the sub-headings, the text about the Charter along the bottom, and the main heading itself. This is where I found out that the paper I was using, Lavis Fidelis, was softer than I wanted it to be. I’ve had a large roll of this paper, about 350 gsm in weight, for a very long time and I thought it would be perfect for this piece, which turned out to be very large. But over the years, the hot pressed surface had slightly softened, and the paint in the large letters did not sit evenly on the surface. Every stroke on the title and the poem at the top had to be over-painted. 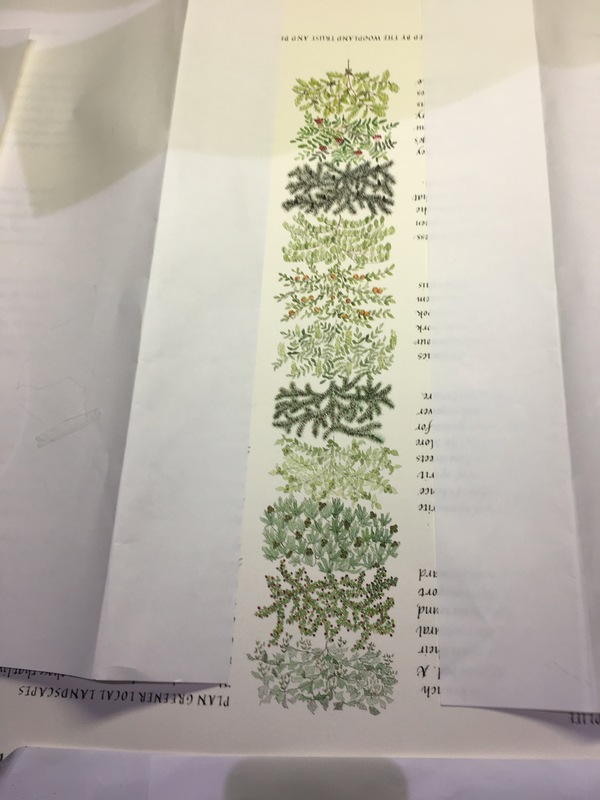 However, I was pleased with the fact that having the lines justified gave neat edges to the right and left margins, which was particularly important with the central painted decoration. However, what with writing on paper where it’s not easy to erase mistakes without it being seen, this was an added level of stress that I could have done without! Note that both text columns line up top and bottom despite the extra line in the left-hand column. 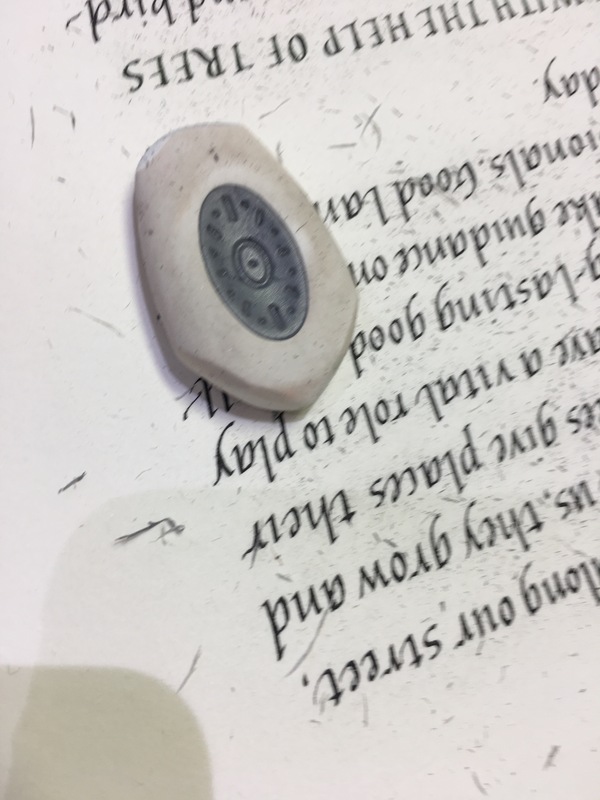 And once I had finished the writing and allowed the ink and paint to ‘settle’ for at least 24 hours, I had to be really careful in erasing the lines because the ink was so fragile. This eraser was a new one, and it had a point when I started. Because of the delicate paper surface, it took me about three hours just to remove the lines! 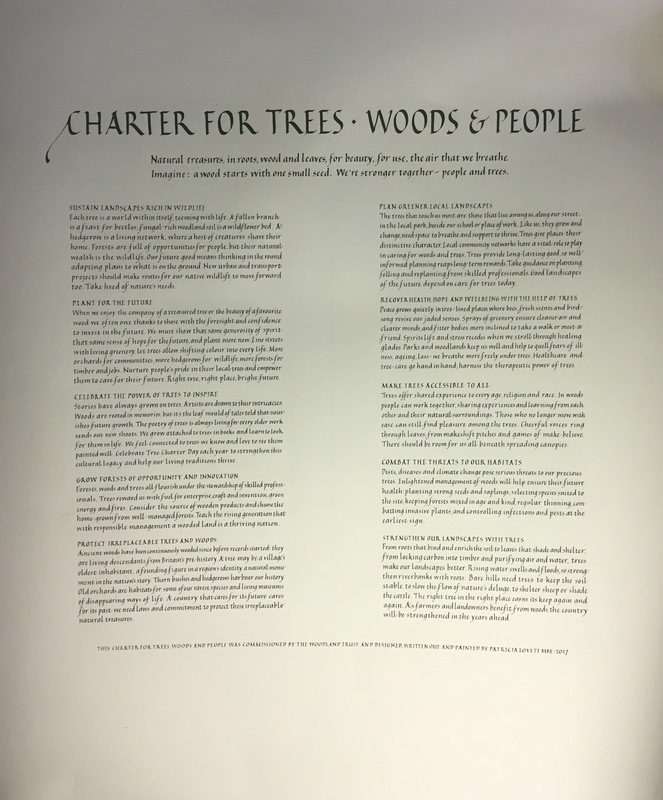 Now the Charter is large, 78.5 by 82.5 cms, and this meant that the paper stretched way below my sloping board especially when I was writing close to the top of the Charter. 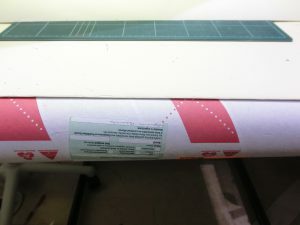 It is so easy just to lean on the paper without thinking and crease it, so I used a cardboard tube placed over the bottom edge of my board and taped it underneath the guard sheet. I had cut a vertical section along the length of the tube so that the tube would fit over the board and this created a smooth round surface for the paper to slide over. 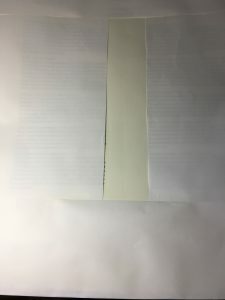 Even if I leant heavily on the paper, the fact that it was backed by this curved shape rather than a straight edge meant that the paper remained undamaged. 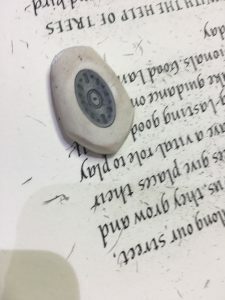 I am often asked if I ever make mistakes – the answer is far too often – but as I use vellum these can be erased without trace. However, despite every check, I made a major error which meant that I had to start all over again. The lines of text in the blocks varied in number from five to eight lines, and the headings needed lines ruled at different heights – all requiring great care – so it wasn’t just a case of drawing lines the same distance apart all the way down the page, but drawing lines appropriate for each separate block of text and its heading. I never start at the beginning because no matter how much you try to relax you are always tense before you start writing and this comes out in the hand and writing. Starting elsewhere and then going back to the beginning one you’re relaxed and into writing the piece is a better approach. So I started at text block seven, which went OK and so I wrote out text block eight. 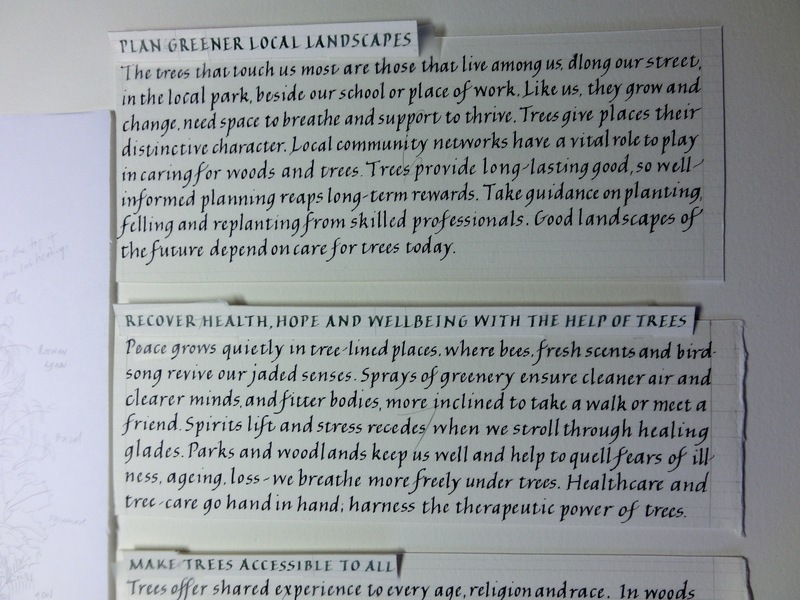 Then, for no apparent reason, I picked up the paper strips of text for block ten rather than nine. Block nine had fewer lines then ten, but I only realised this when I ran out of guidelines! 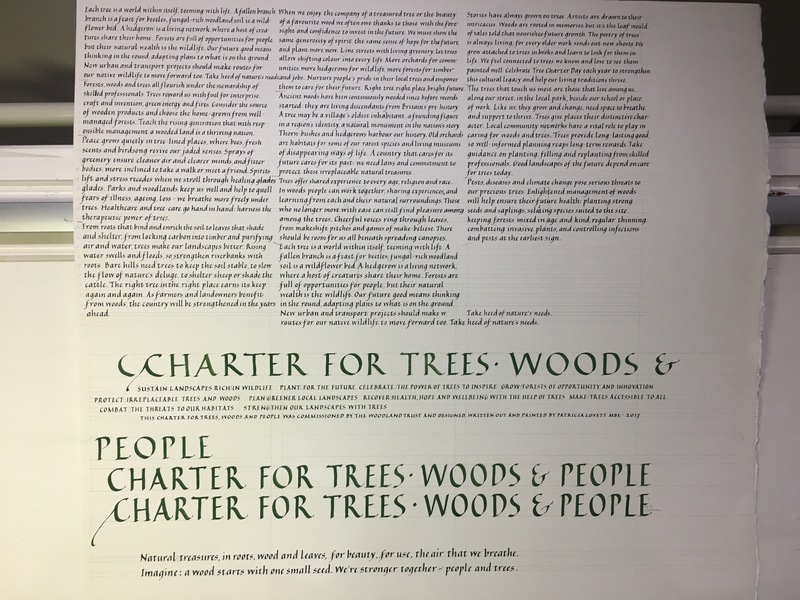 I thought – and hoped – that the Woodland Trust would not mind too much the reversal of these two text blocks, so I went back to the left-hand side of the paper to identify the guideline measurements and drew the appropriate lines. HOWEVER I took the wrong inter-linear measurement – how could this have happened? 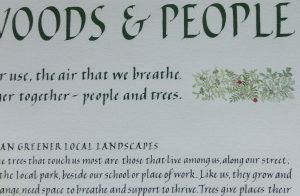 So although mixing up the text blocks might have been acceptable, lines too close together as evident in the last two lines here certainly weren’t! So it was the huge job of marking out and re-drawing all those lines for the whole piece on a new piece of paper! Then it was on to the decoration. 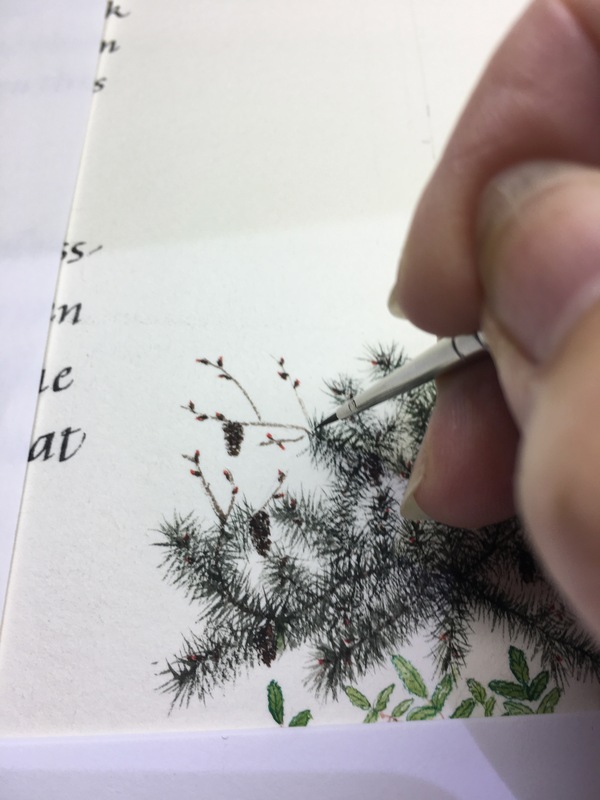 I started to paint each type of tree carefully on another piece of paper to get the design and balance right. This was an education in itself as so often things are in calligraphy and painting. How did the leaves hang on the branches – up/down/flat/singly/in clusters/evenly along the branch/randomly? And were the veins symmetrical or random, and having got the shape of the leaves were the edges smooth, jagged, rounded, pointed etc etc. I learned so much doing this. Annoyingly, despite all my preparations beforehand, the softness of the surface of the paper meant that I couldn’t transfer any of the designs over because in erasing any pencil or similar lines, the paint also came off the paper! 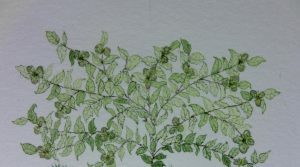 So, having got the idea of the leaves etc, I just had to take a deep breath and wing it. 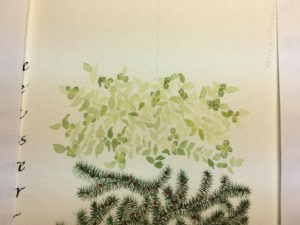 I set out the faintest guideline in pencil for branches and then used very dilute Schmincke gouache and a very fine Kolinsky sable da Vinci brush (size 00) to paint in the leaves and fruit/seeds, having done all that previous research. 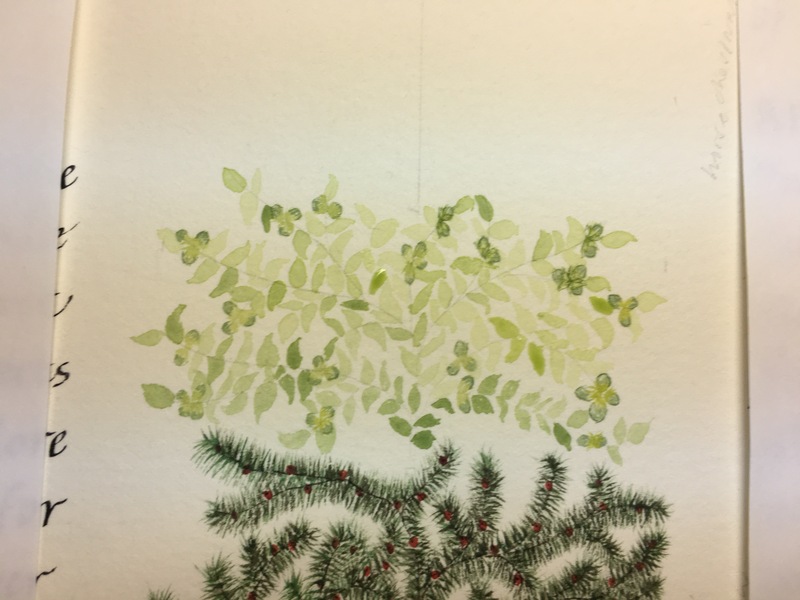 Next, I used the fine brush and outlined the branches and leaves, put in the veins, added further colour to the leaves and fruit/seeds and finished the painting off. 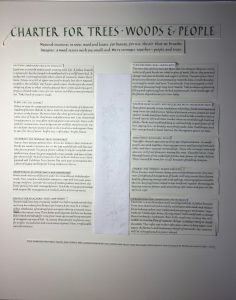 It all sounds so easy but actually each tree took the best part of a day with the research, initial painting and then the final painting on the Charter. Above and here are the hazel leaves and nuts. 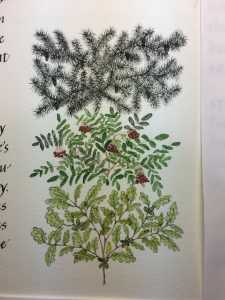 I enjoyed all the painting and for the Douglas fir and yew I counted how many separate tiny strokes of paint I made for one short section along the branches. There were over 350 strokes not more than a couple of millimetres long in three colours for a section less than 10 millimetres long! As I say so often in my courses, the consistency of the paint and the control of it is crucial and it was here. Before I started painting I covered the text completely, as it had taken me so long to write, the last thing I wanted was a green blob of paint across the lettering! So I worked my way up from the bottom painting the trees, here it’s oak, rowan and Douglas fir. Once it got too far for me to reach from the bottom, I turned the Charter round and worked on it upside down. So from the top here it’s sycamore, hawthorn, horse chestnut, hazel, yew, ash and apple. 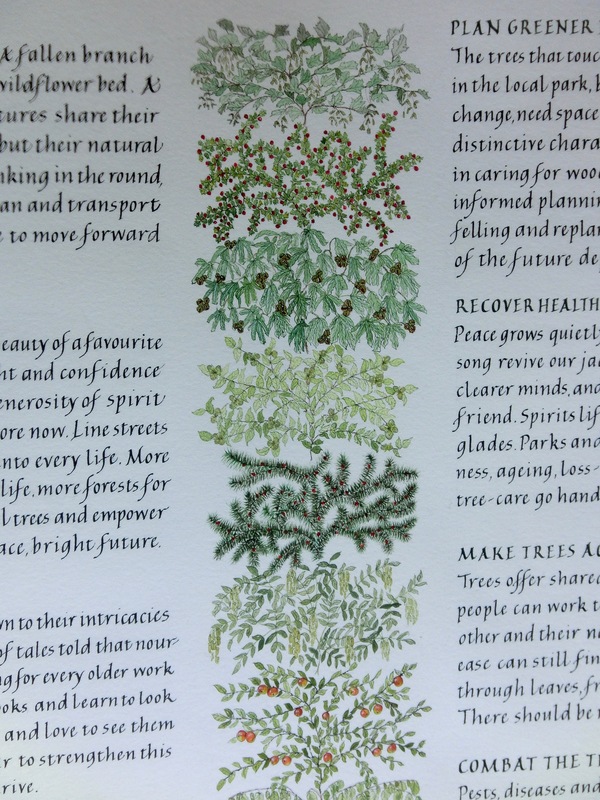 The order in which the trees were featured was up to me so I spread those with red berries throughout the column as red, being a complementary colour to green, would make a sharp contrast and visually ‘ping’, and also carefully placed the ones with darker leaves, or more spikey ones etc so they were evenly balanced and didn’t dominate too much. This is the completed central column of trees. 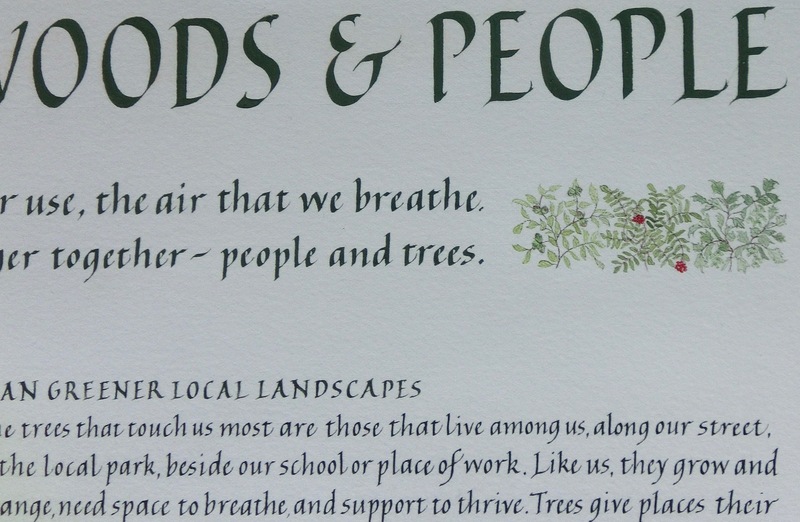 I then added tiny little blocks of leaves and fruit either side of the poem at the top. These were about 1.5 cms square in all. 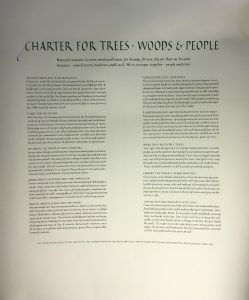 This brought some colour and interest to the top of the Charter. 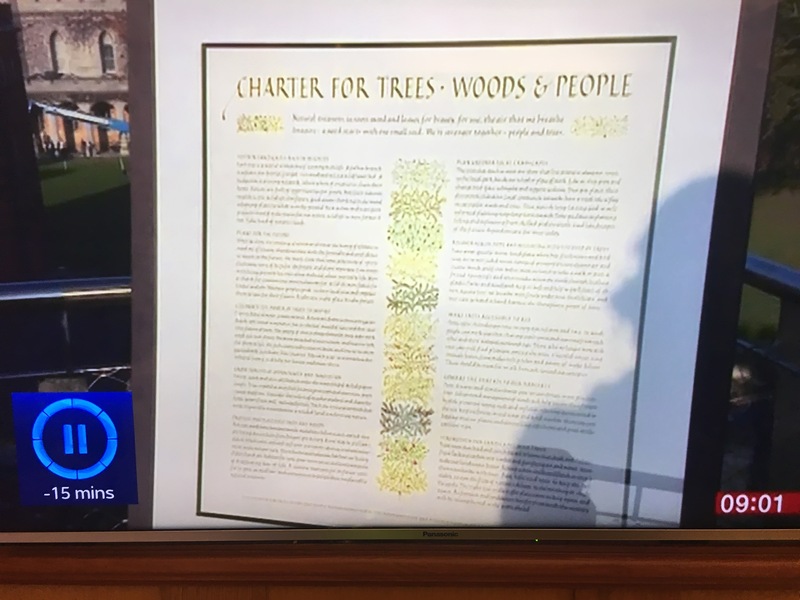 There was a lot of publicity for the Charter and it was featured on BBC1’s Countryfile programme on November 5th 2017, and also on BBC Breakfast on November 6th, as shown here. 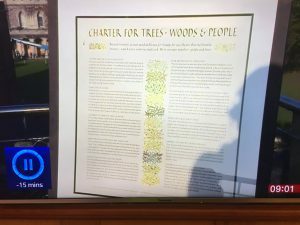 I did shiver when I saw the Charter in all that sunlight on Lincoln Castle ramparts, but it was taken inside straight after the programme! 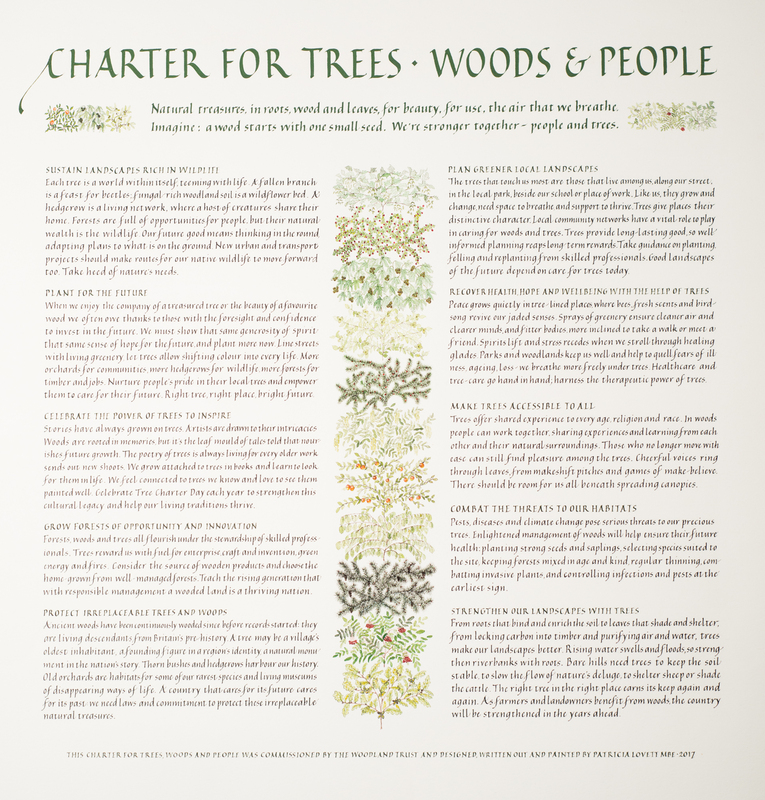 The whole experience of designing, writing and painting this Charter was one that I enjoyed very much indeed, and the benefit was that I learned so much about trees. 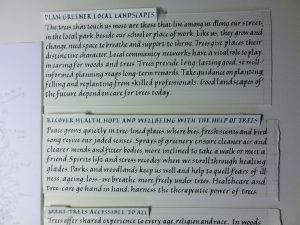 I am most grateful to the Woodland Trust for giving me this opportunity. 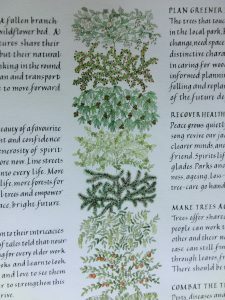 This entry was posted in Blog, Calligraphy and lettering, Calligraphy techniques, Interesting stuff and tagged 1217, 2017, calligraphy, Charter for Trees Woods and People, Charter of the Forest, Lincoln Castle, painting, Schmincke gouache, Woodland Trust on 7 November 2017 by Patricia.